A Blog page for those concerned about Bleadon and want to be involved. Recent reading of Summer 2013 Village News and a perusal of various Parish Council minutes has prompted BOB to re-awake from a glorious (for England) Summer slumber and reflect with comment on some current (& past) issues. Goal Posts Farce continues as pricetag mounts! 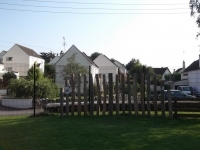 Another potential £1000 to move some timber posts looks likely as the Playground 'GoalPost' saga continues. (see OS minutes of 9th & 12 September 2013). The original PC aspiration for the playground goal posts (aka several lengths of timber posts placed on end into the ground forming a wooden wall to hit a ball against thus minimising impact noise) was priced at £4000. However members of the public (& even councillors) baulked at this huge cost but having sourced a cheaper option the pricetag is now set to rise having installed the posts in an potentially unsafe place. The PC unfortunately decided to put them too close to the fence at a cost of £1000+ where surprise surprise the older children who don't play football (or just aren't competent see this PC notice) went looking to compensate for the removal of the old challenging climbing frame and took to the trees, fences and goalposts to stave their boredom. Already BOB has been informed one child has broken an arm while climbing a tree instead of a purpose built climbing frame. 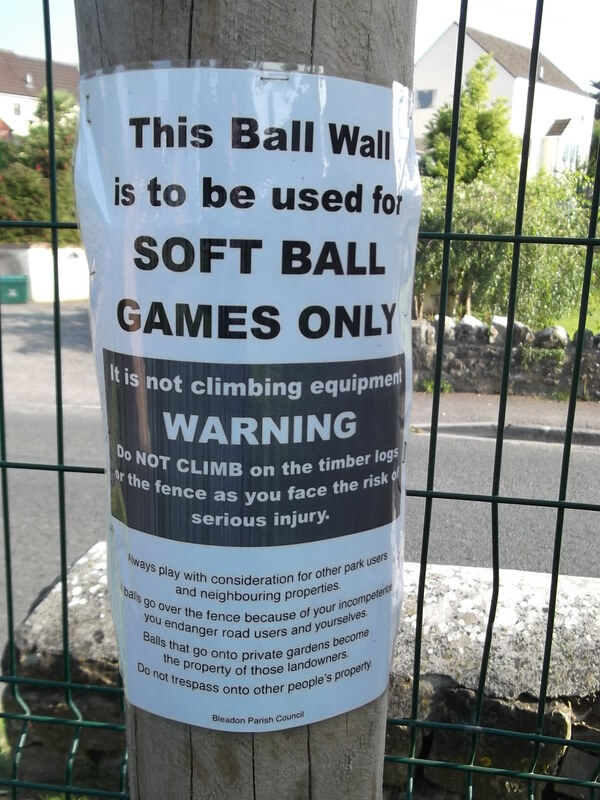 Following this event, and letters from concerned residents regarding balls in the road and children climbing on the new structure and fence, the PC paid ROSPA over £200 for their view on the installation.Why no-one on the PC thought to ask ROSPA first (especially as ROSPA safety concern was given as the original reason to remove the old play equipment) thus saving this moving cost is probably best posed to the PC. 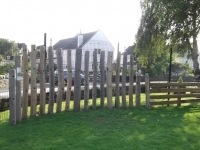 The outcome is that the goal posts are now to be moved to the area of the old climbing frame and the tops of the logs to be cut at 45 degrees to deter climbing or should we say make it more challenging for children to climb! So the cost of these 'goalposts' and fencing is likely to grow to the region of £3,000 yet when will our primary age & above school children get the challenging equipment they deserve, and used to have in our park? When will the PC ask ALL the users of the park for their views on it's development and ensure the park is a facility that ALL can enjoy? It is also hard to believe that some councillors don't consider asking the public for their input is a good idea! (see OSC minutes 12th August 2013). 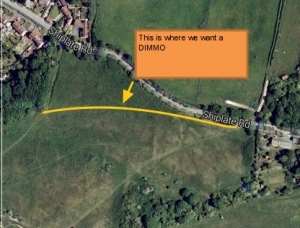 The 'new' farmer on South Hill has decided he doesn't want people walking around his land as they have done for generations and wants to change the existing route of PROWs over it and confine walkers to walk the 'legal' line only in future. 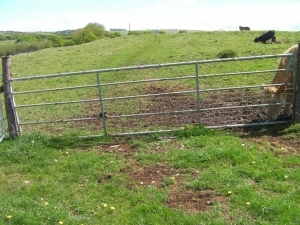 He has installed an apparently "much needed" stock management fence around the perimeter, also bisecting the hill from North to South, and rather than leave a new strategic gate unlocked thus still allowing a relatively level circular walk, the landowner has instead wrapped the gate with barbed wire blocking a route that has been enjoyed by residents and tourists for decades. Elderly Dog walkers in particular have already stopped using South Hill because of this and BOB thinks it's a real shame and loss to the general publics historic right of way. Other local walkers and associations like OSS and Ramblers have also raised their concerns with NS over these changes and it was hoped some compromise could be reached with the landowner but to no avail and now the change of PROWs will be decided by a North Somerset committee in November. So, to anyone who has EVER used this route on South Hill (from Wonderstone Stile to The Veale gate path), especially during the last 20 years and more, can they please contact BOB so that they can be added to the list to claim our right of way for future generations to enjoy! 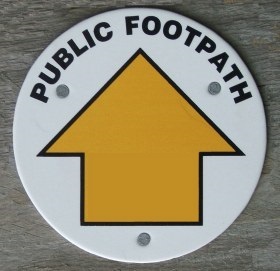 To gain official access for future generations to the historical route, we would need to 'claim' a 'new' public right of way path. Would you be willing to sign and/or help try to find others who would sign and give evidence that they have historically used this path? Collectively we need to have been using the path for 20 years or more. Attached here is a PDF copy of the form required (or also in Microsoft Word format) which will need to be completed, collated by BOB and finally submitted to North Somerset. Please let BOB know what are your views on the latest situation by contacting us and/or comment on this blog? Also to refresh your memory, the proposed PROW plan is here on this previous blog post. Meanwhile, case of the missing footpath solved (ish)! 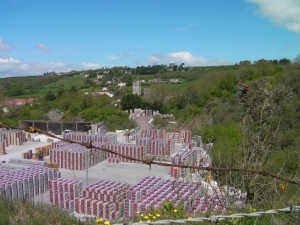 Regular BOB blog readers may recall a previous footpath issue, again involving South Hill. North Somerset created a footpath extinguishment order that suggested a footpath on South Hill may have been quarried away, however research of old maps back to the late 1800's now suggest that it was probably a mistake in the creation of the definitive PROW map which was then subsequently digitised to overlay on the real-world map with the accuracy of GPS coordinates and satellite imagery and it was this being corrected. Although, as suggested with historic recollections in the Village News (Summer 2013 edition), it does appear that the path has been eroded away from the original route and fence moved. This erroneous digisation by NS has also caused confusion with other routes across the landowners fields not matching the waymarkers with maps, add to that potential diversions and confusion can exist on exactly where you are allowed to walk and roam. It is for reasons such as above that BOB believes our heritage walks and open spaces should be preserved where possible today for future generations tomorrow to enjoy as Bleadon's new business NatureKids would hopefully agree. More PROW information from iPROW, Open Spaces Society, Ramblers. BOB is glad to read in the Full Parish Council September minutes that following a long period of inactivity (you may recall that BOB had agreed to meet interested parties in May 2013 but this offer was not taken up by the PC), Councillor Clive Morris has now taken on the role of website mantainenance and is making progress with this important Quality Council communication issue. 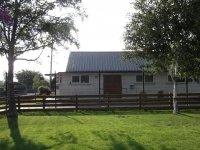 Already new pictures and contact information for our councillors is available and I am sure that timely meeting dates/time, agenda, informative minutes, statutory reports and important parish consultation correspondence/documents will also soon be made available. BOB could not quite believe reading in the September Minutes that the PC will actually consider applying for the Quality Parish Scheme re-accreditation when/if it is re-launched. Perhaps the continued costly visits to SLCC 'training' events during this year has had some effect and the PC feel confident the residents will recognise the benefit of spending more of our money on this quango award! PLEASE consider the real tangible benefit of this process to residents before doing it again, we seemed to do OK before 2003! Although subject of previous blog post (linked here) I thought I would remind people to please make the effort to attend the presentation meetings scheduled for Wednesday & Thursday this week at the Youth Club building. If you can't go then make sure your views are heard through friends, neighbours so that any forthcoming planning application can be influenced before it is made.